Three Fingers Lookout is perched atop a thin finger of rock thrust toward the sky, 6,850 feet above sea level. On two sides of the building, there’s a sheer drop to rocks below. It’s a hard spot for a building to survive. 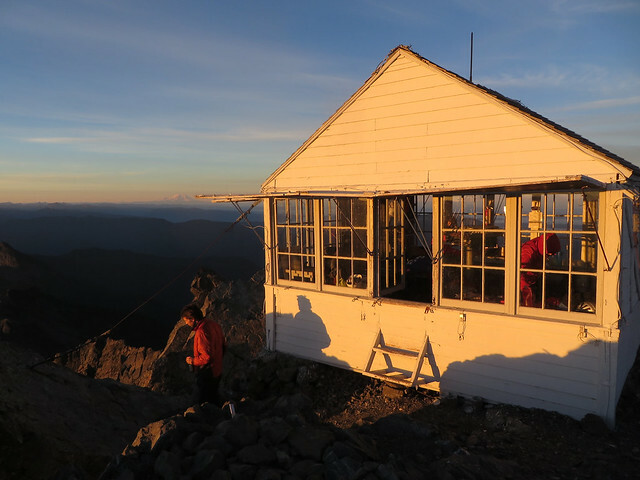 Exposed to weather, the fire lookout is blasted all year. In the summer, it’s bright sun. In the winter, ice and snow. And the rest of the year it’s wind and rain. Keeping the lookout standing is a brutal chore. Arthur Wright, a member of the Everett Mountaineers lookout and trail maintenance committee, has led that effort since the mid-1990s. Just getting there is a challenge — about 16 miles and 5,000 feet of gain. Most hikers need two days. The Three Fingers are in the Boulder River Wilderness southwest of Darrington in the Mount Baker-Snoqualmie National Forest. Recently, Wright and a group of volunteers replaced the old, leaky roof on the building, which was built in the early 1930s. The roof hadn’t had a major overhaul since the Everett branch of The Mountaineers began caring for the lookout in the mid-1980s. The volunteers also performed other maintenance, including window repair and painting. The majority of the roof work was completed over four days in early September. Fire lookouts, including Three Fingers, are a part of local history, Wright said, and worth the effort to preserve. And Three Fingers “is in a very precarious position,” he said. When the lookout was built, the top of the mountain was blasted off to create space for 12-by-12-foot building. But a 14-by-14 building was sent up instead. It barely fit. Wright has also led efforts to level the building, which was slumping. That required hauling loads of concrete mix, bundled up in manageable loads. That’s the norm when work is needed on Three Fingers. Volunteers carry in all materials, such as paint or glass. They also carry in the necessary tools and equipment, including safety gear. This time volunteers still carried in plenty, including a lot of safety gear, but the job was made somewhat easier by a helicopter delivery of roofing materials and tools. The Snohomish County Sheriff’s Office helicopter, often used for search and rescue missions, used a cargo net to deliver the goods. Wright, who has the required training, assisted the helicopter crew from below. He was there when the material was dropped off and again when the old material was taken away. Normally, a helicopter drop would not be allowed at the lookout because it is within the wilderness area. But the U.S. Forest Service decided the use of a helicopter was the best way to do it. The helicopter drop saved volunteers countless trips over the long, rough trail. Peter Forbes, the Darrington district ranger, said that in a wilderness area the Forest Service usually tries to ensure non-mechanical and non-motorized methods are used. That works for a project requiring a little bit of work at a time, Forbes said. “When you get to other kinds of repairs, it’s not practical to have people pack in a bundle of shingles,” he said. The Forest Service conducted what’s known as a “minimum requirements analysis” before allowing the helicopter work. Officials considered issues such as wilderness values and the safety of the workers. Even with the assistance of a helicopter, it was a challenging job. Workers needed to watch their step. They used harnesses and ropes for the more dangerous tasks. The old roof was removed and replaced with new cedar shingles. The helicopter hauled out the old shingles, which volunteers had to carefully pack so they could be hauled out safely. Gwen Tollefson, one of the volunteers, said it was like playing Tetris with shingles. Dustin Wittmier did the majority of the actual roofing work. Wittmier had several summers’ worth of experience building roofs. The biggest challenge of the job was the time-consuming nature of being connected to the roof with ropes and harness. He was constantly switching between anchors, which is a time consuming process, and he had to force himself not to cut corners in the interest of speed. Additionally, he had to begin nailing in the shingles while sitting in a contorted position on the roof. Normally, a roofer would begin nailing from a ladder. At Three Fingers, there’s nowhere for a ladder. He also had to work around the rope, which was frequently in front of him. Wittmier said he’d normally expect to build a roof that size in two days, but this one took four. Simply staying at the site was a challenge. Getting water required descending to the base of a snowfield, about 400 feet below the lookout. Using the toilet required a trip down a ladder and a rock scramble. Gwen Tollefson, one of the volunteers, got involved because she enjoys working with Wright and the others, some of whom she frequently joins for trail maintenance. Tollefson and Wittmier emphasized that Wright’s knowledge, hard work and organization made the project possible. “The things he accomplishes for that lookout, and others, are tremendous,” Tollefson said. Tollefson said Three Fingers has many charms that make it worth the effort, including expansive, 360-degree views. 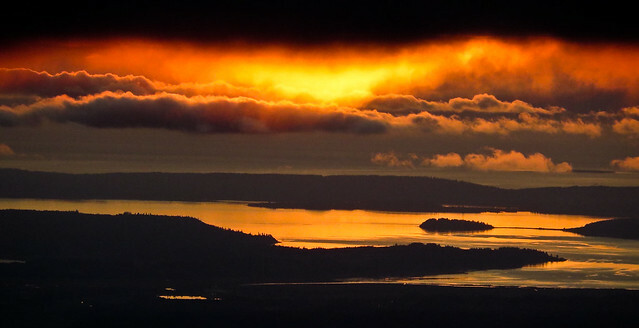 On clear days, you can see Mount Baker, Glacier Peak, Mount Rainier, Puget Sound and the Olympics. 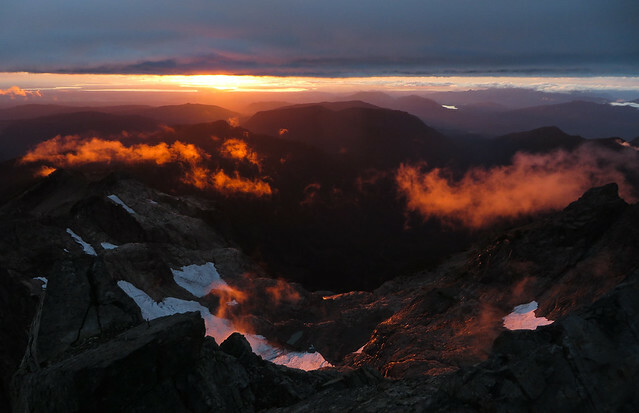 While at the site on an early work party, Wright and the other volunteers were able to see the Jumbo Mountain Fire burning south of Darrington. “It’s a cool place to visit, and if you like being alone in the wilderness, it truly is one of those Kerouac experiences,” Wright said. If you’d like to visit Three Fingers Lookout, you need to be prepared and know what you’re doing. You’ll also need an ice ax, possibly crampons and the skills to use them. At this time of year, remember that daylight is short and, because the lookout is at 6,850 feet, you have a very good chance of encountering snow and ice. Weather changes quickly. The trip is long and, in some places, extremely rough. The trip begins on a old road, which can be biked to speed things up. Once you’re on the true trail, things get hard. “If you want to see a really bad trail, the trail from Tupso Pass to Saddle Lake is one of the worst trails you’ve ever been on,” Wright said. Expect roots, rocks, unstable downed trees, brush, big steps and slick rocks. Many people worked hard on the Three Fingers project.